One of the younger releases in Glendronach's Batch 13 of single cask releases. This was matured in a single Pedro Ximenez Sherry puncheon and just 641 bottles have been released. Limited to just 1 bottle per customer. Aromas (without water) Chocolate and sweet dates dusted in cinnamon sugar develop to rich leathery tones of nutmeg and clove, followed by a warmth of red chilli. Flavour Toasted oak spices lead to a beautiful depth of dark raisins and stewed orchard fruits, laced with gentle vanilla, orange zest and candied ginger. 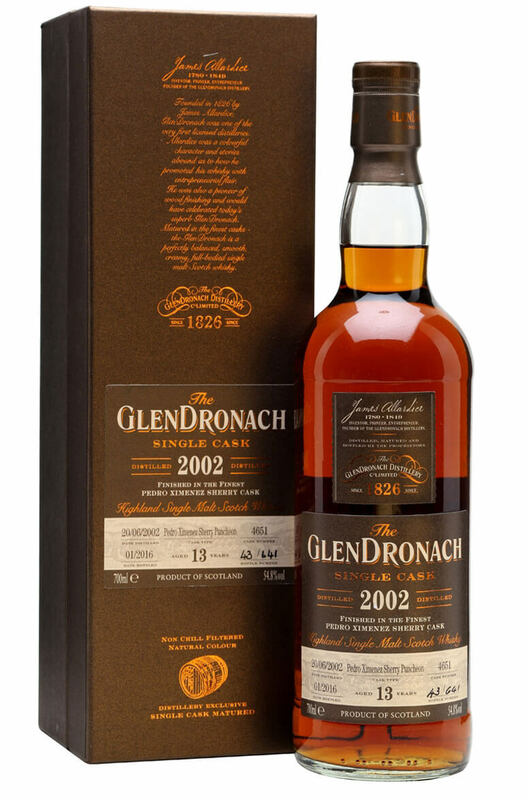 The oldest known bottling of Glendronach at an incredible 47 years of age. This was aged in a single..
A Pedro Ximenez cask matured single malt from Glendronach. This is from batch 13 of the distillery&#..
A fine Pedro Ximinez matured Glendronach from batch 13 of the distillery's single cask series. J..
Cask 930 is a Pedro Ximenex Puncheon and is one of the younger bottlings in Glendronachs 13th batch .. The youngest of the nine whiskies in Glendronach's 13 batch of single cask bottlings. This has b..